Warner Home Video is set to release the Blu-ray extended edition of Peter Jackson’s The Lord of the Rings: The Fellowship of the Ring in steelbook format for the first time in the UK. The region-free five-disc blu-ray steelbook will hit the market on March 24. Pre-order here. One of the most magical, intensely spectacular epic adventures in motion picture history comes alive when this extended edition explodes onto Blu-ray Disc with unsurpassed high definition picture and sound. Now fans can see and hear the extended version of The Lord of the Rings: The Fellowship of the Ring at home the way it was meant to be seen. 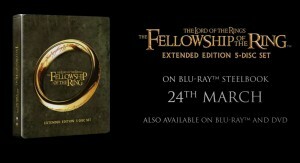 Based on the length of the extended edition feature film and in order to present the film in the highest possible picture quality, the film is presented on two Blu-ray Discs. The Extended Edition Blu-ray will be released in English 6.1 DTS-HD MA audio and includes the newest transfer of The Lord of the Rings: The Fellowship of the Ring which was remastered from the original 2k digital files. The single set boasts nearly nine hours of additional content, highlighted by the rare behind-the-scenes documentaries created by Costa Botes, the filmmaker given unprecedented access to the set of each production by Peter Jackson. Costa Botes was able to capture raw and riveting behind-the-scenes film footage. His unique approach to storytelling – allowing the footage to speak for itself – results in an intimate and candid backstage pass to the challenges, preparations and camaraderie that went into shooting one of the greatest cinematic adventures of all time. The feature-length documentary focuses on a number of complexities and circumstances that tested the filmmakers, cast and crew during the shoot, as well as a look at some of the comical antics and personal moments on the set. The Costa Botes documentary accompanies acclaimed special features by Michael Pellerin from the original extended cut release to make this the most comprehensive The Lord of the Rings compilation ever.